Free shipping to United States with $50 purchase from BIJOUXbyMeg. See item details below for sale terms. *14k Gold Filled or Sterling Silver Components* NO Plated Materials! ♥Shimmering flat cable chain, standard size is 18 inches. ♥9mm dainty discs (3/8 inch), stamped with your initials - please see last photo for font chart. Heart & Ampersand are available for stamping as well. 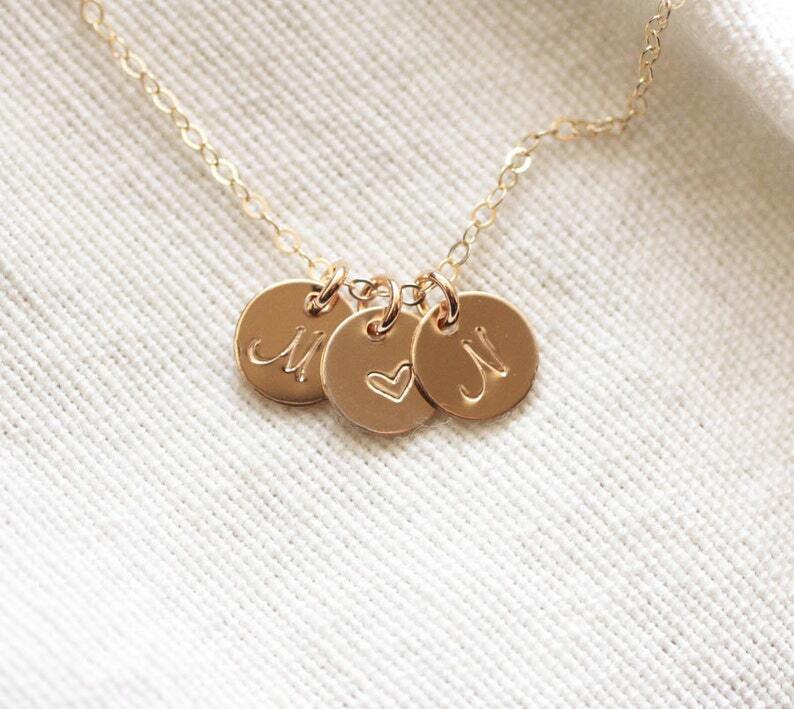 ♥This necklace can be made with two initials and the heart or ampersand stamp, or three initials (without the heart)! ►Please remember to include your initial/font choice(s) in the "message to BijouxbyMeg" box in your Etsy shopping cart!!! ♥Your purchase will come thoughtfully packaged and ready for gift giving. If this purchase is a gift that we are shipping directly to the recipient, please let me know if you would like me to include a handwritten message, so they know who the gift is from. You can leave me a note in the "message to BijouxbyMeg" box at checkout with your short message. ❤Please read my shop policies before purchasing: http://www.etsy.com/shop/BijouxbyMeg/policy?ref=shopinfo_policies_leftnavsh orders. Mother's Day Sale! Valid through 5/3/16. Spending over $50.00? Please enjoy FREE SHIPPING (domestic only). Works just like it’s supposed to. I can finally layer necklaces!!!! Layering Clasp, Layering Necklace Spacer, Gold Fill, Sterling Silver. Minimize tangle when layering necklaces! ★If we are shipping directly to the gift recipient, and you would like to include a handwritten message, please leave me a note at checkout to let me know! How do I let you know the personalization details for my order? When ordering a personalized piece, please be sure to include all personalization details in the "Note to Seller" box at checkout (in your Etsy shopping cart). If this was missed during purchase, please message me here on Etsy to let me know the details for your order! Please note that larger orders are created and ready to ship within 1-2 weeks of purchase (depending on my current workload). If you need your purchase to arrive sooner, please contact me prior to purchasing to be sure that I can accommodate your time frame. Bridal Party orders are NON-Refundable, due to the amount of time needed to handcraft the order. Please purchase a single sample piece first if you are unsure that the jewelry will meet your needs! How do I care for my jewelry? Most importantly, do not shower, swim, or exercise while wearing your jewelry. Extra care must be taken to ensure that your new handcrafted piece will last you many years. Please remember that due to the delicate nature of dainty jewelry, sleeping with your jewelry on is not recommended, as movements during sleep can cause breakage. ★MOISTURE, salt water, chlorine, soap & perspiration take their toll on fine jewelry. Apply self-tanners, sunscreen, lotion or perfume and allow them to dry before putting on jewelry. Frequent cleaning is recommended to maintain its true beauty. A little bit of warm water and Dawn dish washing liquid (gently scrub with fingertips) will remove impurities, and restore shine to your jewelry. PAT DRY before storing! All pieces are created with Sterling Silver and 14/20 Gold Filled Components, unless noted otherwise in the item description. All components are NICKEL FREE, and are considered hypoallergenic. In my experience, even the most sensitive skin can tolerate Sterling Silver and Gold Fill. Please note that Sterling Silver is more prone to oxidation (tarnish), but it is VERY easy to restore to a shiny & new finish. Sterling Silver dip cleansers are the quickest/easiest option to remove oxidation, but polishing cloths and buffing pads will work as well. Gold Fill is less prone to tarnish. It is important (for both metals) to clean your jewelry frequently to remove all impurities that will lead to buildup (which leads to tarnish). Mild dish washing liquid (such as unscented Dawn) and warm water will remove impurities and restore the shine to your jewelry. I recommend cleaning once or twice a week if wearing your piece everyday. Please contact me ASAP if you are unhappy with your order for any reason. Non-personalized jewelry can be returned for a refund of the full item cost (not including shipping fees), if returned *unworn* and in the original packaging (to be assured that the piece is protected during shipment). Please contact me here on Etsy if you wish to return or exchange your purchase. PLEASE NOTE that bridal party orders are NON-refundable, due to the amount of time needed to handcraft the order. Please purchase a single sample piece first if you are unsure that the jewelry will meet your needs! While all of my jewelry is carefully handcrafted, please be sure to follow the care instructions that I send out with each piece to ensure that your jewelry will not suffer breakage. Most importantly, please do not wear your jewelry while sleeping, as movements during sleep can result in damage. I offer FREE repair for any piece that suffers breakage within 60 days of receiving. After this 60-day period, minimal repair fees will apply. Yes! I love my wholesale accounts :) If you are interested, please contact me here or at bijouxbymeg@gmail.com for more info!